Is your ProHeat Nozzle Window broken, missing, cracked or warped? You may need a new Bissell Proheat Clear View or Power Steamer Nozzle Window (Half-Moon, rear) 214-9851 to get your carpet cleaner back into service. 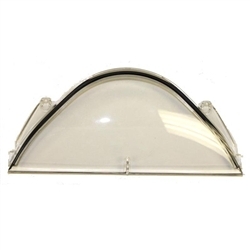 This clearview window is genuine Bissell, and a suitable replacement for earlier models utilizing part 214-9867 window with upper tab (discontinued). Although this replacement window does not have the upper tab, and does not cover the opening left behind by the tab, the window does seal the suction path and will restore full function to your Bissell Proheat Clearview.